More than any other group of macro-organisms, true flies (Diptera) dominate the freshwater environment. Nearly one-third of all flies—roughly 46,000 species—have some developmental connection with an aquatic environment. Their abundance, ubiquity, and diversity of adaptations to the aquatic environment position them as major drivers of ecosystem processes and as sources of products and bioinspiration for the benefit of human society. Larval flies are well represented as ecosystem engineers and keystone species that alter the abiotic and biotic environments through activities such as burrowing, grazing, suspension feeding, and predation. The enormous populations sometimes achieved by aquatic flies can provide the sole or major dietary component for other organisms. Harnessing the services of aquatic Diptera for human benefit depends on the ingenuity of the scientific community. Aquatic flies have played a role as indicators of water quality from the earliest years of bioassessment. They serve as indicators of historical and future ecological and climate change. As predators and herbivores, they can serve as biological control agents. The association of flies with animal carcasses in aquatic environments provides an additional set of tools for forensic science. The extremophilic attributes of numerous species of Diptera offer solutions for human adaptation to harsh terrestrial and extraterrestrial environments. The potential pharmaceutical and industrial applications of the symbiotic microbial community in extremophilic Diptera are better explored than are those of dipteran chemistry. Many flies provide valuable ecological and human services as aquatic immatures, but are also pests and vectors of disease agents as terrestrial adults. The scientific community, thus, is challenged with balancing the benefits and costs of aquatic Diptera, while maintaining sustainable populations as more species face extinction. This article is published as Adler, Peter H., and Gregory W. Courtney. 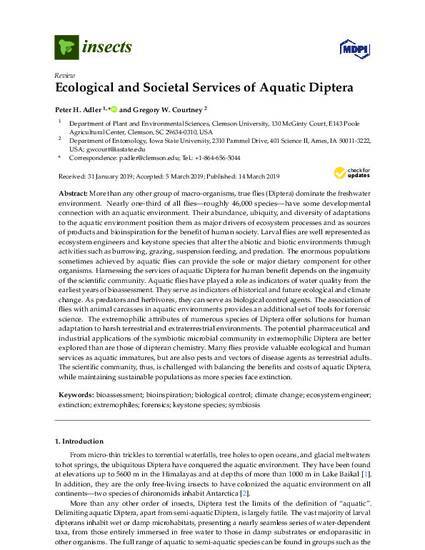 "Ecological and Societal Services of Aquatic Diptera." Insects 10, no. 3 (2019): 70. doi: 10.3390/insects10030070.